We mourn the loss of author and dear friend Richard B. Wright, who passed away at age 79 on February 7, 2017. We extend deepest sympathies to Wright's family and the Niagara community of which he was part for much of his life. The world of CanLit has lost an acclaimed and much admired literary craftsman. An unprecedent Canadian arts achievement, Wright's beloved novel Clara Callan won three major literary awards in 2001: the Giller Prize, the Governor-General's Award and the Trillium Book Award. 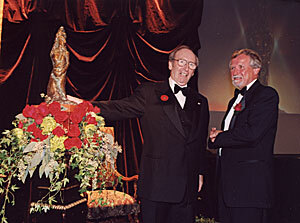 Wright's connection to the Giller Prize also included the shortlist (The Age of Longing in 1995), the longlist (October in 2007) and as a juror in 2005. Saddened by the news, Scotiabank Giller Prize Executive Director Elana Rabinovitch observed, "This is an enormous loss. Richard was probably one of the most empathetic, thoughtful writers working in Canada today. He was a fine person with great character and an extraordinarily talented writer. He'll be greatly missed." 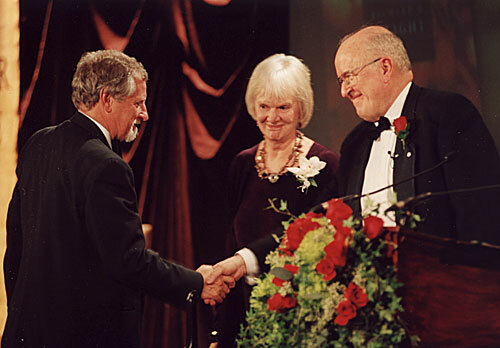 Richard B. Wright is congratulated by 2001 Giller Prize jurors Joan Clark and Robert Fulford. Many have hastened to profile and pay tribute to award-winning novelist an memoirist Richard B. Wright. We've gathered some beautiful pieces here.